Once upon a time, I had a miserable beater. Unfortunately, it belonged to my parents and got traded in when they finally realized they had spent several running 944s’ worth in repair bills. Had it been signed over to me, there was no doubt in my mind where it needed to go to die: the 24 Hours of LeMons. The car was a 2002 Nissan Altima, and my particular example was a miserable bucket of barely-functional bolts known as the Failtima. Needless to say, it earned that name. I wasn’t sad to see it go. This car had left me stranded in the middle of the sweatiest parts of the year far too often, and the new car I got in its place was super rad. Even after it got traded in, I was still telling people that they should go make an offer on my trade-in and toss a roll cage in it. There were many, many reasons why it needed to end up in the 24 Hours of LeMons. That was how the Failtima was supposed to meet its end. It just was. It wasn’t because I liked the car, enjoyed driving it, felt it was easy to work on or knew it would stand up to the challenges of budget amateur endurance racing. No, quite the contrary. I knew it must be punished and probably wouldn’t survive. I needed sweet, sweet vengeance at the hands of fellow LeMons geeks. Of course, I had this car back in the days of Murilee Martin’s frequent LeMons updates on this very site. The dreadful machine even snuck its way into a LeMons Gator-O-Rama post, photobombing the statue of Robo-Johnny. The People’s Curse was still a thing back then, too, although it was starting to be phased out. I wouldn’t want to be voted into the curse because that would (in theory, at least) mean that our team had done something egregiously offensive to the rest of the paddock. That being said, you’re darn right I had just the perfect vehicle to volunteer for cursing if the real winner skipped out, or if nobody deserved it this time: the Failtima. This is what it deserved for forcing me to walk everywhere in an extremely pedestrian-unfriendly college town in the middle of August. Sweaty, humid August in Waco, Texas. 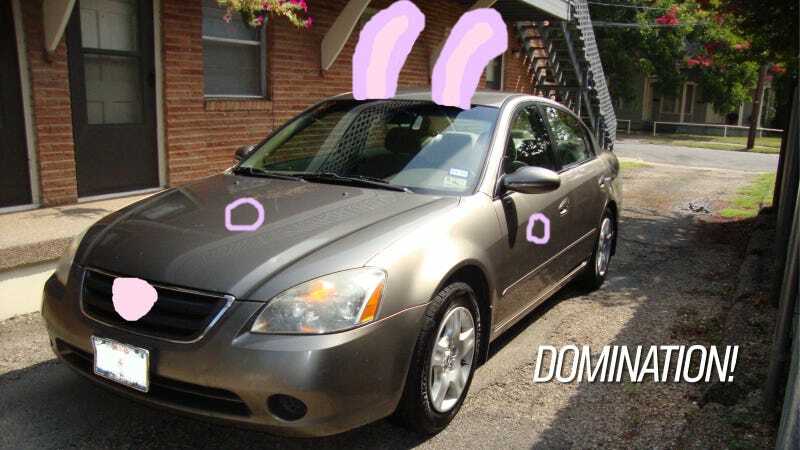 I tried seeing if anyone in central Texas had my old car up for sale anywhere out of curiosity, because the smart thing to do with it would be to put it up on Craigslist as-is (or better yet, donate it to the crusher) and RUN AWAY. While I didn’t see my exact vehicle anywhere, I saw several sketchball, barely-running and non-running examples in the $300-1300 range that would probably fit in the budget after selling off some parts and haggling a bit. That would be the dumb thing to do: pick up an ‘02 2.5L slushbox Altima for vengeance and vengeance alone. I mean, monumentally stupid. Since I can no longer exact revenge on my own former beater, I’ve long given up on the idea, but perhaps you know of a worthy candidate that needs to be LeMon’d on principle. A car so unworthy of continuing to exist that it must be raced ‘til it ‘splodes, and then either hauled off to the hungry jaws of the crusher or fitted with a much improved and ill-advised drivetrain swap. 914-powered Failtima? Yes. 914-powered Failtima. A 914-powered, rear-engine Failtima should be a thing, because “914 swap” is the answer to all life’s problems. Which car would you enter in LeMons out of spite? Show us in the comments below.